Storing and retrieving small pieces of information in cookies a common requirement in many web applications. This article explains with an example how ASP.NET Core 1.0 deals with cookies. You will learn to read and write cookies using ASP.NET Core. 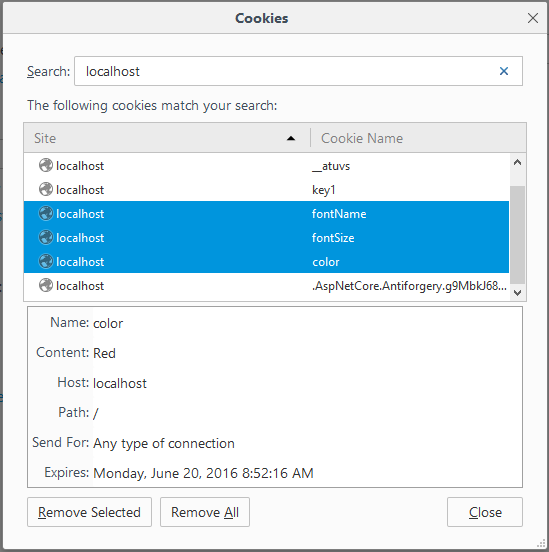 You will also learn to configure the cookie properties such as expiration time. As you can see the page allows you to specify certain preferences such as font name, font size and color. You can select a preference from the dropdown list and specify its value in the textbox. Clicking on the Write Cookie button saves that preference in a cookie. The Is Persistent checkbox controls whether the cookies are to be stored on the local disk so that they are be read during a different browser session. The read cookies link takes you to another page where the preferences are read and applied to a sample HTML markup. Begin by creating a new ASP.NET Core Web Application using Visual Studio 2015. Then open the HomeController and add three actions to it - Index(), WriteCookies() and ReadCookies(). The Index() action is quite straightforward and simply returns the Index view to the browser. The WriteCookies() method receives three parameters namely setting, settingValue and isPersistent through model binding. The setting paremeter will be the value selected in the dropdown list. The settingValue parameter will be the value entered in the textbox and isPersistent will indicate whether isPersistent checkbox is checked or not. In the above example, you set the Expires property of the cookie to one day from now. This way the cookie will be persisted on the client machine for one day. Then a cookie is written to the response using the Append() method of the Cookies collection. The Append() method accepts key, value and CookieOptions object. The else block of the code simply appends a cookie by setting its key and value (no CookieOptions object is passed). A ViewBag message indicates to the user that the preference is stored successfully. The Index view renders a <form> shown earlier using ASP.NET Core tag helpers and input elements. It also outputs the Message property from ViewBag. A Read Cookies link takes the user to a test page where preferences are applied. The ReadCookies() action reads three cookies with the help of their respective keys. This is done using Cookies collection of the Request object. The cookie values are stored in ViewBag properties. A series of if statements check whether a particular preference is empty and if so assign a default value to it. The ReadCookies view consists of a <div> element whose style attribute makes use of font name, font size and color specified in the respective ViewBag properties.